Back in Brisbane and time to zip up to Bribie Island for some local land-based fishing. But the wind had other ideas. I arrived at around 4.30 am on Tuesday and it was blowing hard from the south-east. It was only about 15 knots on dawn but it soon picked up to about 25 knots. I started fishing at the mouth of the Buckley’s Hole tidal lagoon. The water from this ever changing land mark now comes out almost level with the new Bribie Island seaside museum. Low tide was around 6.00 am and I started fishing here just after first light, at around 5.00 am. I was using my Loomis GL2 light spin rod, Shimano Stradic 3000 reel, 10lb braid, 12lb fluorocarbon leader, a 1/6th oz 1/0 jighead loaded with a GULP 5” Jerkshad soft plastic in the Pumpkinseed colour. I moved along the edge of the drop off casting up, into the falling tide and jerking the plastic slowly along the bottom, back towards me. The jighead kept slowing and as it got lighter, I realized there were large blue jellyfish everywhere. I was casting the plastic on top of the ledge in no more than 30cm of water. Suddenly I felt a tug and then saw a swirl in the water, then I had a fish on. I played it for a while and after a couple of runs, I started to pull it slowly back towards the sand. But the fish had other ideas and with a couple of furious headshakes it dislodged the jighead and swam slowly back towards the deeper water. As I stood wondering what went wrong, I was surprised to see a couple of good sized Tuna leap clear of the water right at the edge of the drop off. I cast all around but they were gone in seconds. I am not sure how I would have subdued one if I had hooked up! Back to the Flathead – I cast in every direction but as the sun rose, so did the wind and by about 9.00am it was just too hard. On Thursday I was back in the same spot just after dawn. The wind had dropped considerably and low tide would be around 8.00 am this time. I started with the same soft plastic – the 5” Pumpkinseed Jerkshad. I waded out to the same area where I had lost the fish on Tuesday and after 20 minutes of peppering the terrain with casts, I was onto a fish. It was a Flattie, I played it very carefully back to the sand and where it measured in at around 55cm. 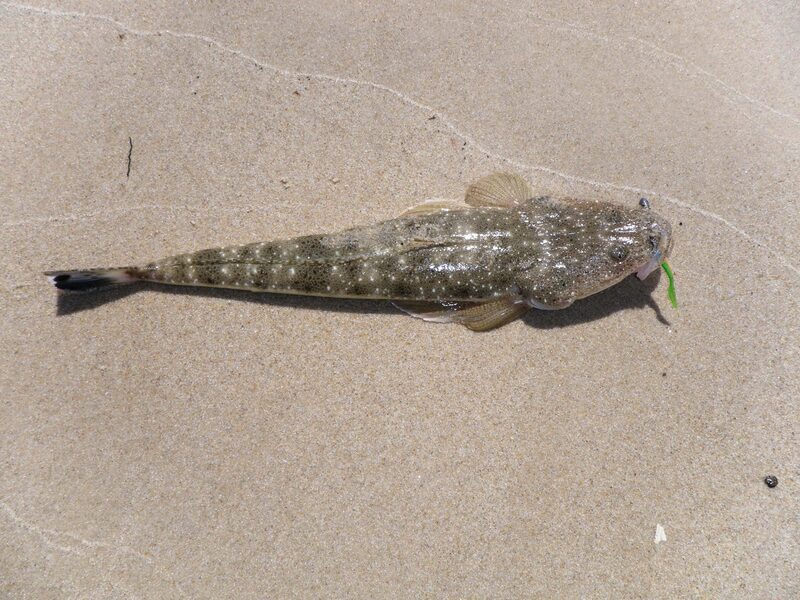 I waded back out and caught another 35 cm Flathead about ten minutes later. I then decided to move south along the beach towards the southern tip of the island. 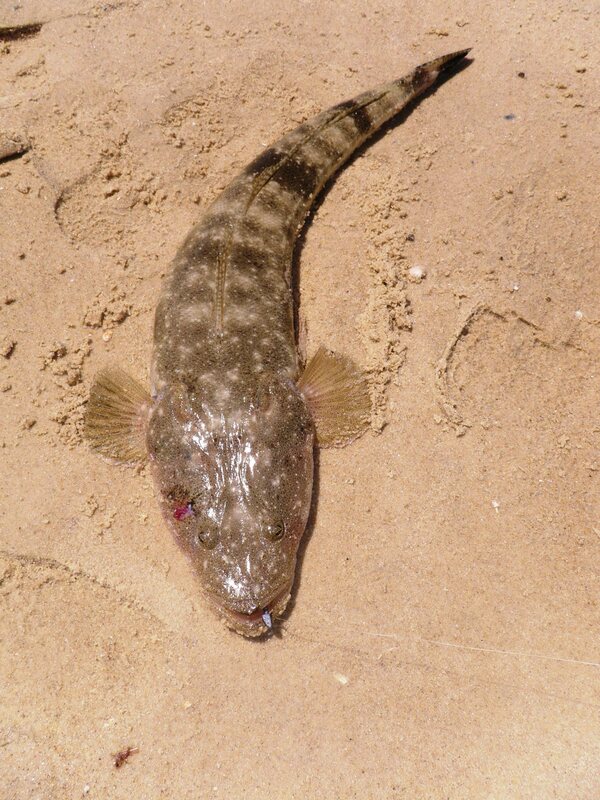 As a walked across the mouth of the big drain, I caught another undersize Flathead, but spooked a much bigger one, that took off across the sand. I walked down the beach casting as I went. I swapped through a few different soft plastics but did not get a touch. Finally just as I reached Beach Flag No.1, I sent a large Flathead skittering off across the sandy bottom. I was in ankle deep water and there was absolutely no structure around at all. It was right on low tide. I stopped and cast all around. I swapped down to a 3” Minnow in the Pearl Watermelon colour, still nothing. I turned and walked back towards Buckley’s Hole. I cast inland, in to the shallower water. Infuriatingly, I almost stepped on another three Flathead, who went flying off passed me into the depths. I could see them, but I could not seem to catch them. I found myself back where I had started and decided to dump the subtle approach. The tide had now just started to run in. I put on a GULP 5” Crazylegs Jerkshad in the Curry Chicken colour. After three or four casts it paid off and I had another fish on. I safely steered it back to land – it was a 42 cm Flathead. I decided it was time to try the other side of the Pumicestone Passage. I drove over to the old oyster jetty and waded out onto the muddy flats. The sea grass is now growing quickly and most of the ‘snot’ weed seems to have died off. 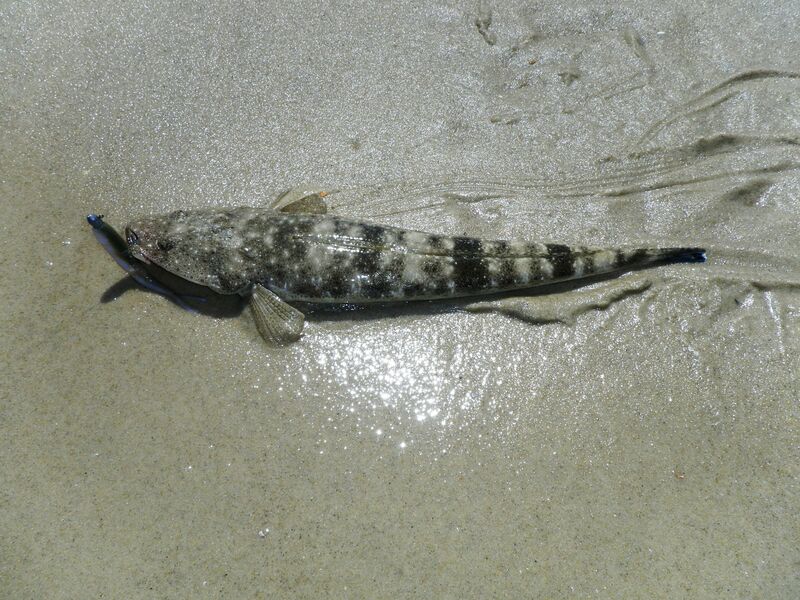 I stuck with the GULP 5” Crazylegs Jerkshad and after a few casts, just south of the jetty, I saw a decent Flathead roll over onto the lure just after it hit the water. I paused, then struck. I had it on for a bit and then it spat the lure out. I moved south and after wading for about 50 meters, I cast out and hooked up with another. This time I dragged it carefully, all the way back to the sand. It was a 45cm Flathead. By now the water was getting to high to fish the edge of the weed banks so I decided to call it quits. I had only landed three fish but encountered many more. There are obviously plenty of Flathead around – but I need to get better at catching them!! I continued to fish the beaches and rocks of Deepwater National Park, just south of Agnes Waters, but the weather was quite changeable. I tended to catch a few fish early in the morning when there was a light south-easterly and then things would go quiet in the afternoon as the wind turned round to a northerly. I fished the morning high tide at Flat Rock on Tuesday. The rock was covered and I cast from the beach at its inner edge. The Stripeys were sitting under the edge and relentlessly attacked the GULP 3” Pearl Watermelon Minnow. Every now and then I would find a patch of Bream and I caught about four keeper size fish, but none were bigger than 30 cm. There were also a few Whiting. A school of something was moving up and down feeding a hundred meters beyond the rock and the birds where dive-bombing. At low tide on Wednesday I walked out over the oyster covered rocks at the southern tip of Wreck Rock bay. I have been monstered in this spot on several occasions and also seen the Tuna come in close enough to cast at. The overhangs at the base of the rocks hide plenty of resident fish. I decided to try something new and rigged a GULP 7” Sandworm in the Blood colour, on a 1/6th 2/0 jighead. I lost a couple to the small Dart and Butter Bream and then bang! I was hooked up to a better fish. It headed straight down into the rocks and fortunately I had some 16lb leader on. I pulled it out and landed it with the aid of the wash. It was the best Stripey of the week at about 35cm. This is about as big as they get inshore. I cast out again in the same spot and caught a few smaller ones. I carried on fishing around these rocks for about another hour as the water ran out to low tide. As I was retrieving a cast, in close to the rocks, I felt a thump and then zzzzzzzzzzzzzzzzzzzzzzzzz. It was a very hard hit by a decent fish, but suddenly the line went slack and it was gone. I retrieved a mashed soft plastic sand worm. It must have changed its mind. It had not been a spectacular week of fishing, I had fed myself, enjoyed the surroundings and caught plenty of fish. But I had seen evidence of some monsters lurking and witnessed a few big hook ups. As always, there was just enough to convince me that I need to get back up here soon! I decided it was time to look for some serious fish. This area is a ‘Mecca’ for land based fisherman looking to catch big pelagic species. The one place that everyone heads for when they are up here is the ‘Catwalk’. The ‘Catwalk’ on the eastern side of 1770 headland is strictly a heavy gear fishing location. 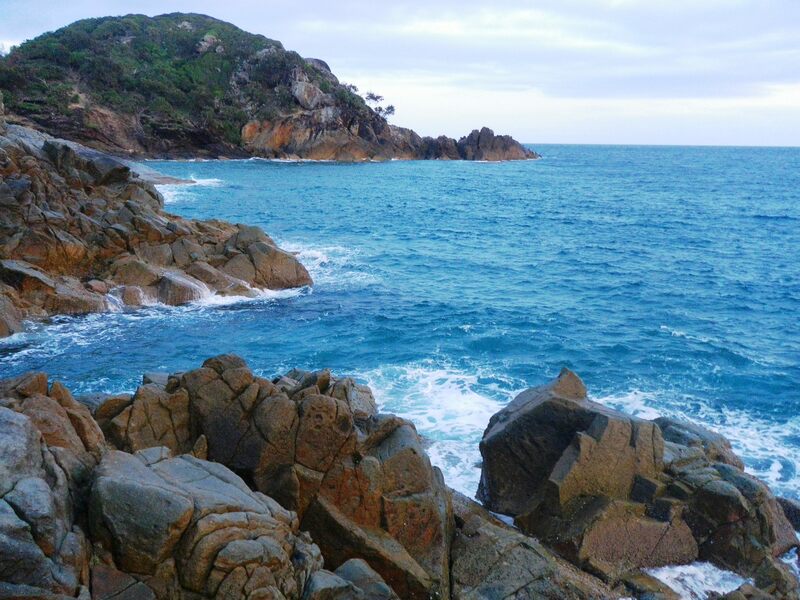 It is one of the best land based fishing spots on the east coast of Australia. This is because it is one of the few places where the East Australian Current comes within casting distance of the shore. On a clear, calm day you can see the current line snaking straight past the foot of the rocks. When the pods of Tuna break the surface they are almost always swimming near or along the current line, chasing the bait schools that move with it. This doesn’t mean catching fish here is easy. 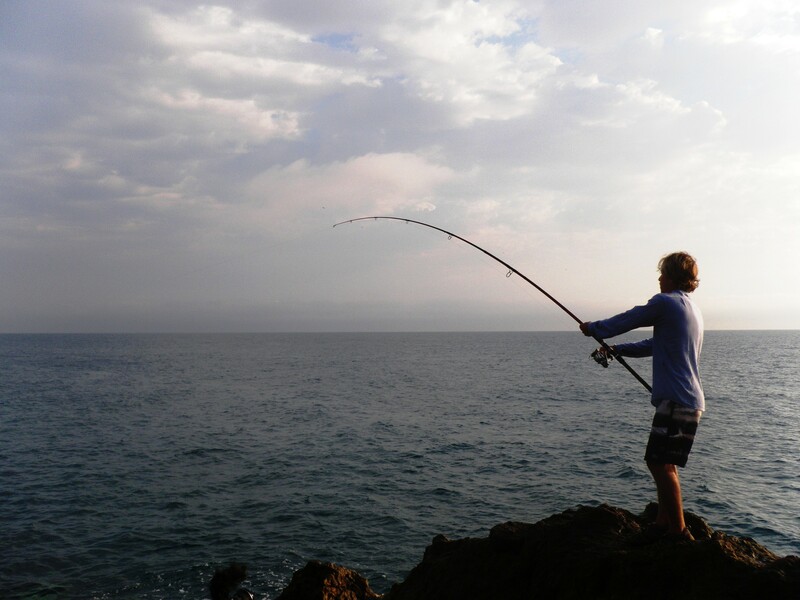 For one thing most of the fish on offer are big – 10kg and above. This means you need patience, heavy gear and a good gaff, to stand a chance of landing something. The food chain is also highly developed, there are plenty of lazy sharks around who will happily rob you of your fish, as you bring it in and if they don’t get it, the two or three enormous resident Groper will regularly snaffle big fish at the foot of the rocks. My thanks to the various locals who fish these rocks – particularly Dennis and George who are always willing to give me an update on what has been happening and which lures, baits, tides are working best. When I arrived on the Catwalk this week, there had been plenty of big fish hook ups but not many successful captures. The Tuna had arrived in the second week of September and some big Spanish Mackerel had also been wreaking havoc. On the Sunday of my visit George had landed a monster 25kg Giant Trevally which he had snared with a 130mm fluorescent yellow, bibless minnow, cranked along just below the surface. The Spanish Mackerel had been grabbing poppers, slugs and bait and the best bite time seemed to be sunrise through to about 9.00 am. On the morning I fished the Catwalk there was an experienced crew of land based fisherman from Byron Bay down there and a few others. Just after first light, one guy hooked up with what appeared to be a good sized Spanish Mackerel. He had been casting and retrieving a silvery blue, 140mm surface popper. He played it for a few minutes and began to make some headway. Then suddenly the line went slack as a shark swallowed the fish whole and bit clean through the wire trace. 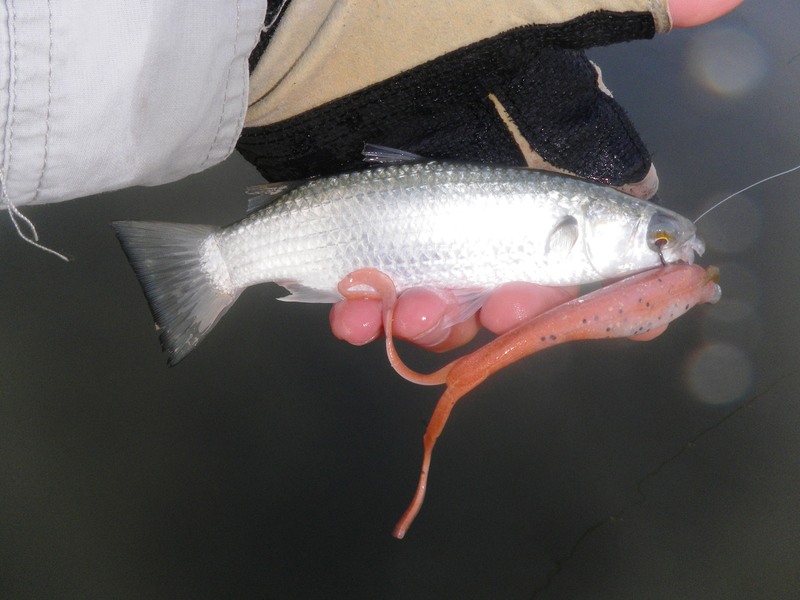 We all started casting again – slugs, poppers and bibless minnow lures. Then the guys at the top of the rocks shouted that a pod of Blue Fin Tuna were heading our way. As they went by we all timed our casts and let rip. Six of us cast into the pod – one guy hooked up. He had a solid connection with a fish and after a few big initial runs, he started to put some pressure on it. It had headed back towards the mouth of Round Hill Creek. It was clearly a big fish as his attempts to get back line where met with more blistering runs. Unfortunately, it was now heading in shore over the rocky and reefy area directly north of the Catwalk. Suddenly the line went slack – the fish was gone – Shark? Rocks? We will never know. 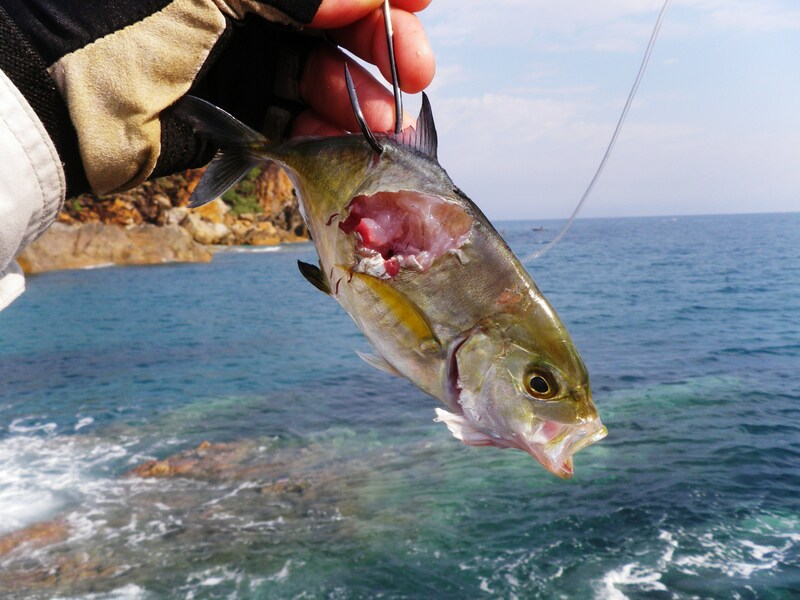 I rigged a small soft plastic and caught a tiny Trevally which one of the Byron crew put out under a balloon. After 20 minutes or so, no more than 4 metres from the shore there was a huge swirl in the water as a Mackerel hit the live bait and almost simultaneously, was swallowed by a sizeable Shark. Miraculously the livebait was intact, but with a neat triangular Mackerel bite on its side. After a couple more hours of casting, there had been no more hook ups so I decided to try some of the land based fishing opportunities in Round Hill Creek. I headed down a four wheel drive track to the edge of Toms Creek a small mangrove lined tributary on the south side of Round Hill Creek. 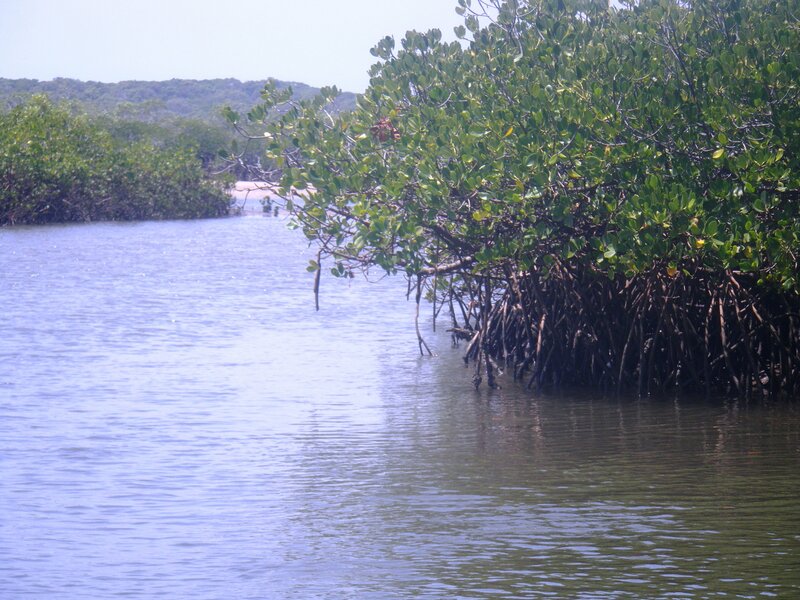 There are a few openings in the mangroves where you can fish the creek. It is a shallow system with a strong tidal flow, so it is best to fish it around the high tide, when the water slows. I arrived about noon and rigged a Gulp 3” Minnow soft plastic on a 1/8th 1 jighead. There were already plenty of midges around so I covered my head and gave myself a good coating of insect repellent. The submerged rocks and mangrove roots looked like good hiding places for Mangrove Jacks, but I suspect the water was not yet warm enough for them. I fished across the sandy/ muddy bottom of the creek, occasionally getting snagged on submerged rocks and water logged branches. I caught Moses Perch, Bream, Whiting, a few grunter Bream and tiny Trevally, none where big enough to keep but I decided this was definitely a spot to return at dawn or dusk, when the tides were right. The storm passed and I woke around 4.00 am thinking the sun was coming up. In fact it was the moon – high above, in a very clear sky. It was a few days off full and so bright, that I did not need a torch to get the billy on and brew up some tea. After a few nights of instant noodles, I needed some protein, so it was time to stop looking for trophy fish and go and catch something to eat. I started at dawn at Middle Rock. High tide would be at about 7.00 am and first light was about 5.00 am. It is just a few km north of my campsite at Wreck Rock, in Deepwater National Park. 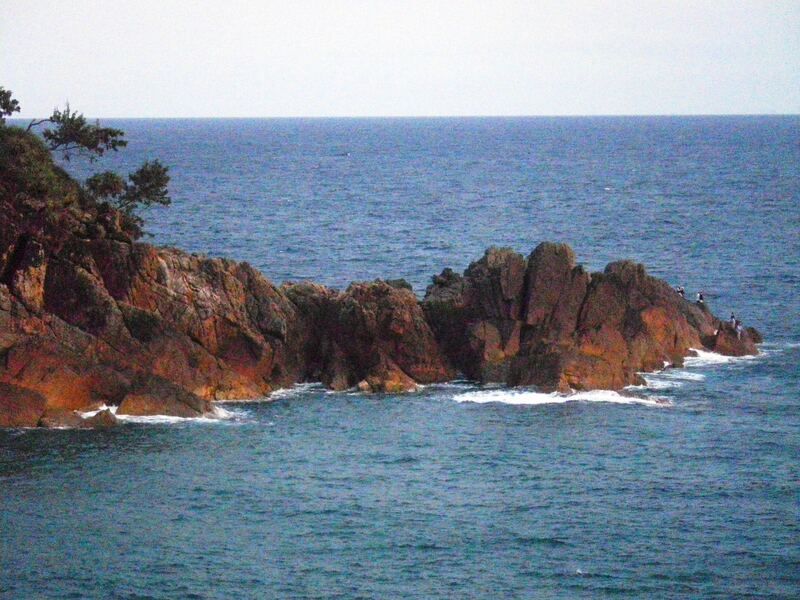 There are three main rocky outcrops with rubble, coral bommies and sandy patches in between. As the sky brightened only the tops of a few of the bommies and the big rocks were visible. I have had a few good Trevally from this spot on high water. I was using the Shimano Catana Light rod again but put on a 16lb leader – just in case something big appeared. I loaded up with the GULP 3” Minnow in the Pearl Watermelon colour on a 1/8th 1 jighead. I cast out, as close as I could to the edge of the half-submerged bommy. I started a quick retrieve – there are too many rocks to let the soft plastic hang around in one spot. I had only jerked the rod tip a couple of times and then I had a fish. It was a nice Bream about 30cm long. A few more casts produced another. 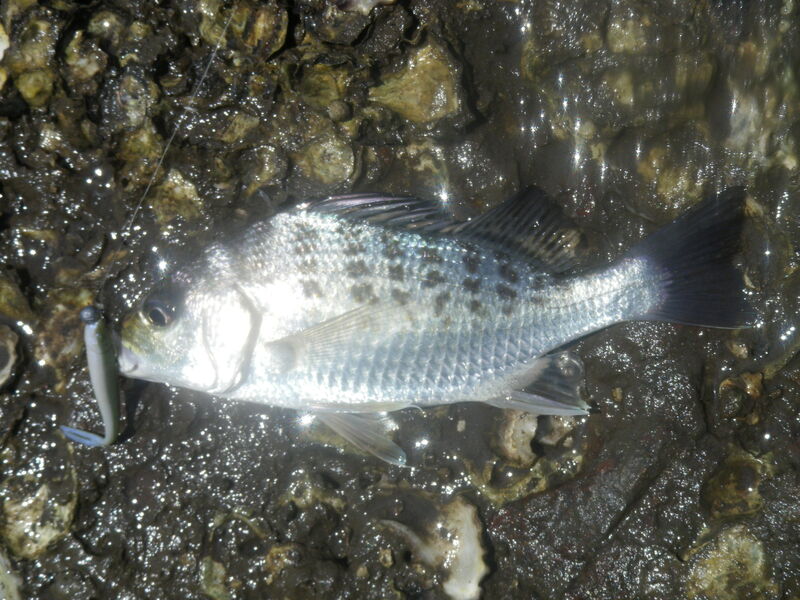 Then I caught a couple of tiny Moses Perch and finally a couple of smaller Bream. The water was calm and glassy and crystal clear, despite the storm. At about 9.00 am I drove up to Flat Rock and waded out onto the partially submerged rock, to fish the rest of the run out tide. Flat Rock is great to fish on once you can stand safely on the rock itself. There are a couple of breaks in the rock that runs the length of the beach and these are good fish congregating areas. I started at the south end where the front of the rock has an almost vertical edge, in some places. These are usually a good Bream spots as there is plenty of wash. Sure enough, as I wandered along the rock casting into no more than 1.5m of water, I caught about five more Bream, a handful of small Whiting, a tiny Bar Tailed Flathead, Butter Bream and lots of small Stripey Perch and Dart. All of the Bream were just about 30cm – so I kept the biggest three. I was impressed with the range of fish but disappointed by the size. I moved down to the southern end where the rock breaks down into a surf beach dotted with submerged bommies, but by about 11.00 am the northerly wind had come up again and the fish seemed to stop biting. I cleaned up the Bream in the rock pools and headed back to camp for some hammock time. I was still camped at Wreck Rock in Deepwater National Park. The best fishing is around the low tide on the local beaches. But I had morning highs for a few days so I started right out the front of the camp site at Wreck Rock, standing on the southern corner of the bay cast into the wash from the rocks. There was a very light swell and a light north-easterly breeze. As the first glow lit the horizon things looked very promising. I started with a 5” Jerkshad soft plastic in the Pumpkinseed colour, rigged on a 1/8th 1/0 jighead. After a few casts and no hits I swapped down to a smaller 3” Minnow in the Pearl Watermelon colour. The sun had now crossed the horizon and unfortunately the wind was picking up. Right at the base of the rocks I felt a solid hit and realized I had a fish on. I reeled it clear of the water – it was a Dusky Flathead – around 35cm long. I released it and carried on fishing. Some other campers had pulled two 50cm + Flathead from these rocks the day before so I was hopeful I might find a bigger one. I swapped the plastic for a brighter coloured Nuclear Chicken version and then, for 2” Shrimp pattern in the Pepper Prawn colour – none of these tempted the fish. Finally, I switched to a 5” turtle back worm in the Pepper Prawn colour and I caught a few small Dart. The wind had been very changeable over the last few days. It was swirling round from the south to the north and back again. Finally it settled into a very solid northerly – 25 knots and forced me off this spot. 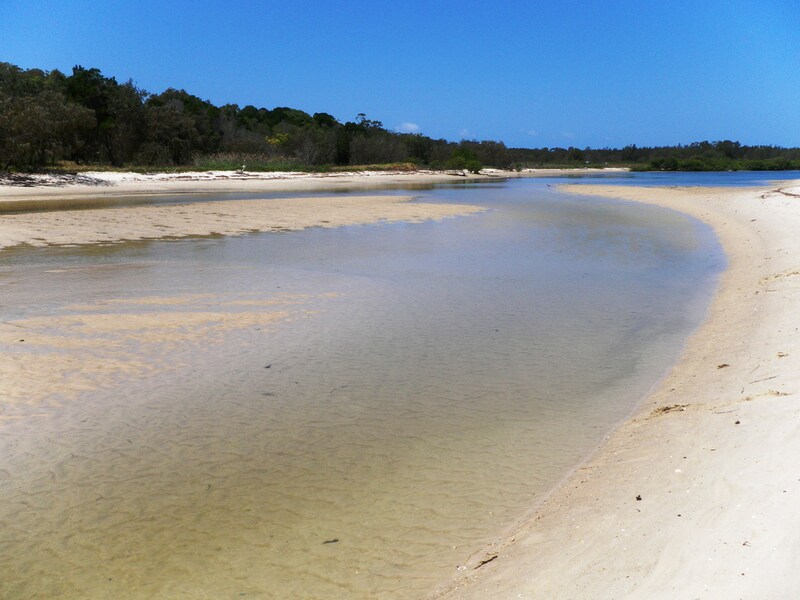 I needed to find some sheltered water to fish and decided to drive up to Middle Creek, to fish the main channel on the bottom of the tide – which would be around 1.00 pm. Middle Creek is reached along another four-wheel drive track off the road into Agnes Waters. The creek has a wide tidal estuary that forms a fairly narrow channel at its mouth, at low tide. You can walk or wade along the south side of the channel for about a kilometer. The track in is currently very easy but can be a challenge after heavy rain. This whole area is effectively a tidal swamp and parts of the road quickly get submerged in a big storm. By the time I got out to fish the wind was howling, blowing the sand off the tops of the banks like a scene from Lawrence of Arabia. 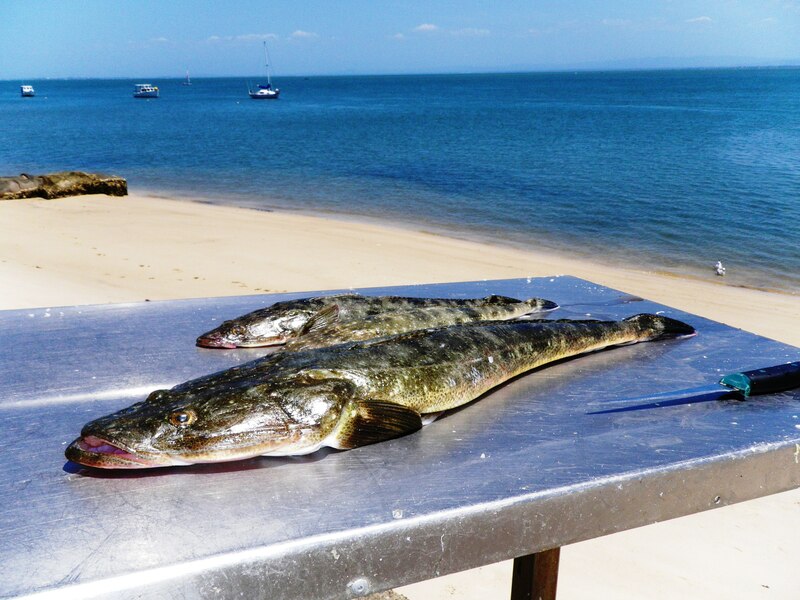 I walked out towards the mouth and started casting, as I waded across a lagoon of shallow water – less than 30 cms deep , I saw a couple of decent Flathead scatter. They are always in less water than you think! I decided to start with a 4” Minnow in the Pearl Watermelon colour – this is my all time favorite Flathead soft plastic. I rigged it on a 1/6th 1/0 jighead as I needed to keep in touch with the bottom. I cast and cast and cast but to no avail. I swapped down to a 2” Shrimp in the Pepper Prawn colour and almost immediately pulled up a tiny 25cm Bar-tailed Flathead. I walked further out, towards the mouth and after another 30 minutes caught another Flathead – this time it was a Dusky, approximately 30 cm long. Then I caught a few Whiting and saw a few Bream in the clear water, but I could not tempt them. The sky had turned a scary shade of grey so I walked back to the car. As I got in the heavens opened and a major deluge started. I drove carefully back along the track which was already underwater in a number of places. The ground had not really softened and the going was pretty solid but I could see how easily this track could become impassable. It had been another morning with no really decent fish. The weather had not helped and, in my experience, a northerly wind often turns the fish off. I spent a wet and windy night in my tent which, thankfully kept the rain out and I prayed to wake up to some sunshine and a light south-easterly breeze.